RHINO RECORDS - Rhino Entertainment Company is an American specialty record label and production company. It is owned by Warner Music Group. 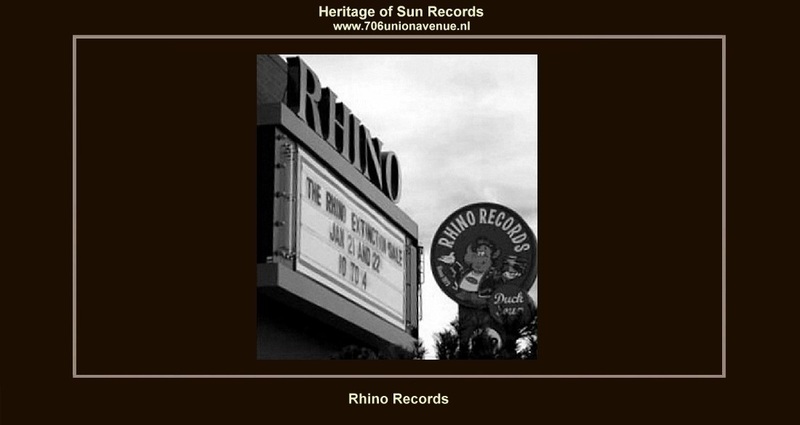 Rhino was originally a novelty song and reissue company during the 1970s and 1980s, releasing compilation albums of pop, rock and roll, and rhythm and blues successes from the 1950s through the 1980s. They were also known for releasing retrospectives of famous comedy performers, including Richard Pryor, Stan Freberg, Tom Lehrer, and Spike Jones. Starting during the late 1980s, Rhino transitioned into a complete entertainment company specializing in home video/DVD re-issues of television programs such as The Transformers. Also programs such as G.I. Joe, Jem, The Lone Ranger, My Favorite Martian, The World of Sid & Marty Krofft collection and Mystery Science Theater 3000, and compact disc releases of select artists and movie soundtracks. 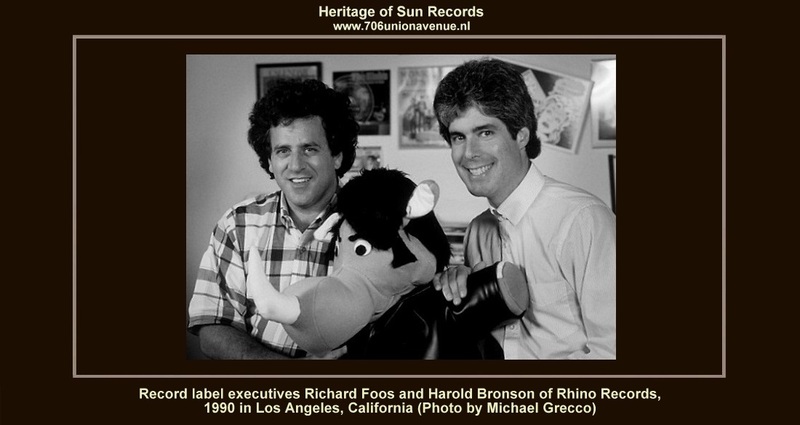 Rhino started as a record shop on 1720 Westwood Boulevard, Los Angeles, during 1973, run by collectors Richard Foos and Harold Bronson. It became a record distributor five years later thanks to the effort of thenstore manager Harold Bronson. Their early releases were mostly novelty records (with their first single being Wild Man Fischer's "Go To Rhino Records") and some punk rock singles; the difficulties involved in getting airplay and distribution for such material eventually caused Foos and Bronson to take the label in other directions. One of their earliest reissues was achieved by acquiring the rights to the White Whale label. By the mid-1980s most of their releases were reissues of previously released recordings licensed from other companies. Superior sound quality (remastering of the original tapes was done under the direction of Bill Inglot) and creative packaging made Rhino one of the most respected reissue record labels, receiving rave reviews from music collectors, fans, and historians. Rhino was quick to get into the compact disc market, releasing dozens of oldies CDs at the dawn of the CD age in 1984. Their retrospective compact disc releases are often remastered to restore or improve upon the original analog release's audio quality. During 1986, Rhino signed a six-year distribution agreement with Capitol Records. During 1989 Rhino and Capitol’s parent EMI made a deal to jointly acquire Roulette Records; Rhino received the US rights to Roulette's catalog, excluding jazz. When the distribution deal with Capitol ended in 1992, Rhino signed a new distribution deal with Atlantic Records, and in turn Time Warner bought a 50% stake in the record company. In 1998, Time Warner bought the other half of Rhino; thus the company became a wholly owned unit of Time Warner. The Rhino Records retail store, which was not part of the sale, closed in 2005. In 1999, Rhino started the Rhino Handmade division of limited edition releases available primarily from their website. All of these Handmade reissues are limited to about 3000 copies or less and once sold out are not repressed. It is through this merger that the label has released remastered editions of collections from such musicians as Eric Burdon, Fanny, Dannii Minogue, The Ramones, The Grateful Dead, Emerson, Lake & Palmer, The Beach Boys, Yes, The Doobie Brothers, The Cars, Chicago, Tom Paxton, Third Eye Blind, The Doors, War, Spirit of the West and most recently The Bee Gees; as well as soundtracks spanning the Turner-owned pre- 1986 MGM and pre-1950 Warner Bros. periods, in addition to WB's own post-1949 period. Rhino's soundtrack releases include Gone with the Wind, The Wizard of Oz, Easter Parade, North by Northwest, Casablanca, King Kong, Doctor Zhivago, Superman, and Finian's Rainbow. Rhino also owns the rights to The Monkees’ master tapes and film footage (which they acquired from Raybert Productions in 1994), and thus has released home videos and CDs from the group. In 2004, Time Warner spun off its music divisions and today Rhino is part of the newly organized Warner Music Group. In addition to dealing with archive material, the label also manages the US distribution or worldwide production of compilations for more recent Warner acts, including still-active artists such as Enya, New Order, and Chicago.